Trunk Show Saturday, April 30th at Click! Come meet Erica Gordon, the blacksmith behind Steel Toe Studios at Click! 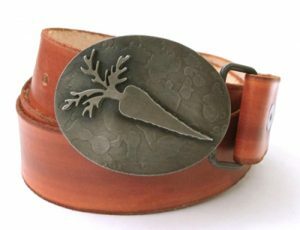 this Saturday, April 30th from 11am to 5pm to and see her new “Urban Farming” line of buckles. She’ll also be bringing a full selection of all designs, colors, and sizes of the fabulous creations that she welds, forges, and fabricates in her awesome Georgetown studio. In honor of the new “Urban Farming” designs, Click! and Steel Toe Studios will be donating 10% of all sales all day long to Lettuce Link, an amazing program that provides fresh produce and food gardening supplies to the people in our area who need it most. Delicious snacks and beverages will be served, including lightly sweetened fizzies from DRY Soda.